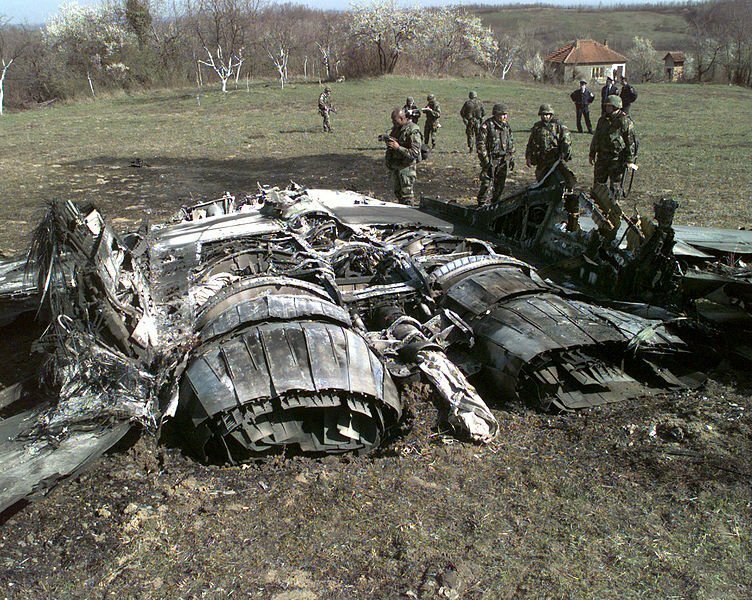 The 493rd FS would claim four Federal Republic of Yugoslavia Air Force MiG-29s destroyed during the brief campaign. Operation Allied Force (OAF) followed repeated NATO warnings in 1998 to Serbian President Slobodan Milosevic to remove his armed forces from Kosovo. Fifteen F-15Cs from the 493rd FS/48th FW, based at RAF Lakenheath, England, deployed to Aviano AB, Italy, in order to provide CAP support and OCA duties. NATO adopted a five-phase plan — initially, its military flights would act as a deterrent, only becoming more aggressive if NATO demands were not met. Despite diplomatic gains made at the Rambouillet talks in France, additional NATO strike assets were still arriving in-theatre as late as February 1999, and newly arrived F-117 stealth fighters displaced Lakenheath’s Eagles from Aviano to Cervia AB. They were simultaneously reinforced to a total strength of 18 aircraft, as jets were sent directly to Italy from a seven-week Operation Northern Watch deployment in Turkey. Operation Noble Anvil — the name given to the US portion of OAF— kicked off on the night of Mar. 24, 1999. As told by Steve Davies in his book F-15C Eagle Units in Combat, the 493rd FS would claim four Federal Republic of Yugoslavia Air Force (FRYAF) MiG-29s destroyed during the brief campaign. At 2200 hrs local time on Mar. 24, 1999, the 493rd FS’s Capt Mike Shower (in F-15C 86-0159) became the first ‘Grim Reaper’ to score a kill when he fired an AIM-120 AMRAAM at a MiG-29 ‘Fulcrum’ as it lifted off from its airfield at Batajnica. Shower initially fired two AMRAAMs without success, but the third, fired at closer range (six miles), found its target. The second MiG-29 kill that night fell to Lt Col Cesar Rodriguez, a double MiG-killing veteran of Desert Storm. Rodriguez (in F-15C 86-0169) claimed his third kill while flying OCA over the war-torn city of Pristina. He was No 3 in a four-ship F-15 OCA force — ‘Knife’ flight, mission 4125F — assigned to protect NATO’s first strike package of the war. 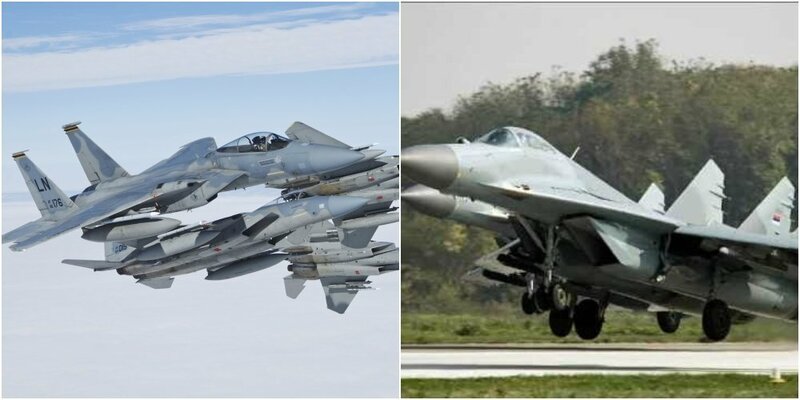 The fighter-bombers were targeting Montenegro airfield, ‘and was also going to take out the radars that were linking the adjoining Kosovo/Montenegro airspace. We were to open up a lane of attack to make the province of Kosovo accessible without contention’, recalled Rodriguez. ‘Knife’ flight would lead everyone into battle — even the stealthy B-2s were scheduled to follow behind it. The mission commander was the F-16 lead pilot, Lt Col Dave Goldfein, while ‘Knife’ would be led by Robert ‘Cricket’ Renner (the 493rd FS’s FWS graduate and weapons officer), with `K-Bob’ as No 2, Rodriguez No 3 and ‘Wild Bill’ Denim, a recently winged Eagle ‘baby’, as No 4. As the C-models took off at sunset, Rodriguez noted the eerie juxtaposition between the dark abyss — and war — to the east, and the sun setting to the West, bathing Italy in a beautiful warm light as the night life started up and people ventured into restaurants and bars for meals and drinks. Approaching the target area, Rodriguez’s flight began to observe a contact which quickly landed before they could engage it. `That aeroplane executed an instrument approach into Montenegro airfield, and the pilot witnessed first-hand the destruction of the airfield. He may even have experienced a bomb or two himself, as he probably did not make it to his hardened facility. The MiG had been detected and locked up at 1909 hrs, flying at 6000 ft, some 40 degrees and 62 miles off of Rodriguez’s nose. AWACS was unable to identify it as hostile at this stage, and two minutes later it beamed to a heading of 300 degrees, causing Rodriguez’s radar to drop the lock. At the same instant, Renner (`Knife’ 11) transmitted that he had an intermittent radar failure. At 1912:25 hrs Rodriguez reacquired the target and gave ‘Knife 11’ a ‘Bulls Eye’ range/bearing reading, recommending that he focus his radar in that direction. At 1912:36 hrs he asked AWACS to declare his target, but received a ‘bogey’ reply, indicating that AWACS was not yet sure. Less than a second later, ‘Knife 14’ transmitted that NCTR indications in his cockpit indicated that the target was a MiG-29. Still waiting to engage, and now down to 30 miles separation from the target, Rodriguez ‘jettisoned the wing tanks so that we could go a little bit faster, climbed to about 33,000 ft and accelerated to Mach 1.4’. At 1913:25 hrs he fired ‘a single AIM-120 against the single contact. The missile came off the rail, shot out in front of me and then selected a lead pursuit curve commensurate to a positive intercept. We executed an F-pole (at 1913:27 hrs) to the southeast so that we avoided going into the Kosovo SAM belts, and tracked the missile towards closure. 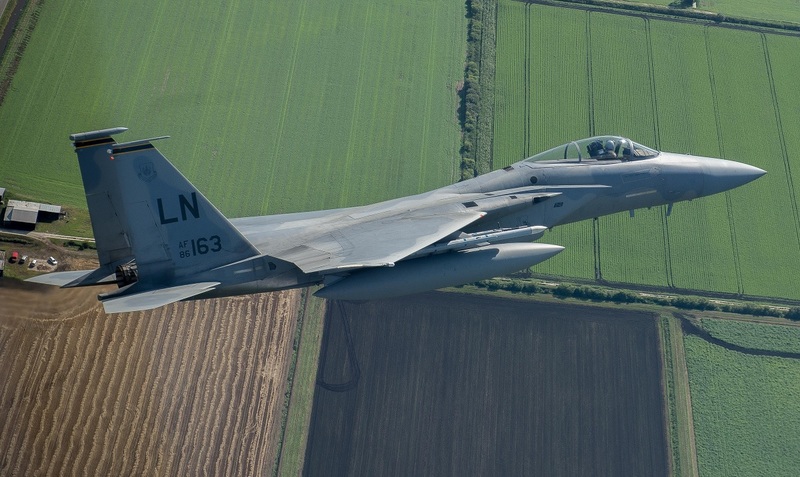 The final two kills for the 493rd came courtesy of Capt Jeff Hwang (in F-15C 86-0156) on Mar. 1999. Hwang was tasked as the Bosnia-Herzegovina DCA flight lead on Mar. 26, and was to provide cover for a vulnerability time of 1500 to 1900 hrs. He and his wingman were eastbound, approaching the Bosnia/Yugoslavia border, having established their orbit over Tuzla following initial refuelling, when he picked up a radar contact 37 miles to the east at 6000 ft, beaming south at over 600 knots. The time was 1602 hrs. Hwang called out the contact and ‘Boomer’ McMurray, his wingman, confirmed that he saw the same on his radar. Unable to immediately EID the contact, and with AWACS unable to see it, Hwang elected not to cross the border, but to enter a right-hand turn to run parallel with it on a southwest heading. He simultaneously called, ‘Push it up! Burner! Tapes on!’, to accelerate the flight from its leisurely 0.85 Mach at 28,000 ft to just below the Mach. He continued his run for 60 seconds (ten nautical miles) before directing the formation to turn back ‘hot’, coming through south to east in an attempt to get some cut-off on the contact. ‘Boomer’ McMurray was on the north (left) side of the formation, and both he and Hwang picked up the contacts at 070 degrees, 37 miles away. Flying at 23,000 ft, the jets were now heading west, straight at them. Hwang was convinced that the contact was a FRYAF fighter because of its location, and the fact that there were no NATO OCA missions over the border at that time. He checked for friendly IFF signals but received no reply, so he called AWACS and asked for permission to engage. AWACS failed to respond, although it had just begun to detect the west-bound contacts on its own radar. Accordingly, ‘Dirk’ flight continued with its own EID matrix as the contact closed to within 30 miles. 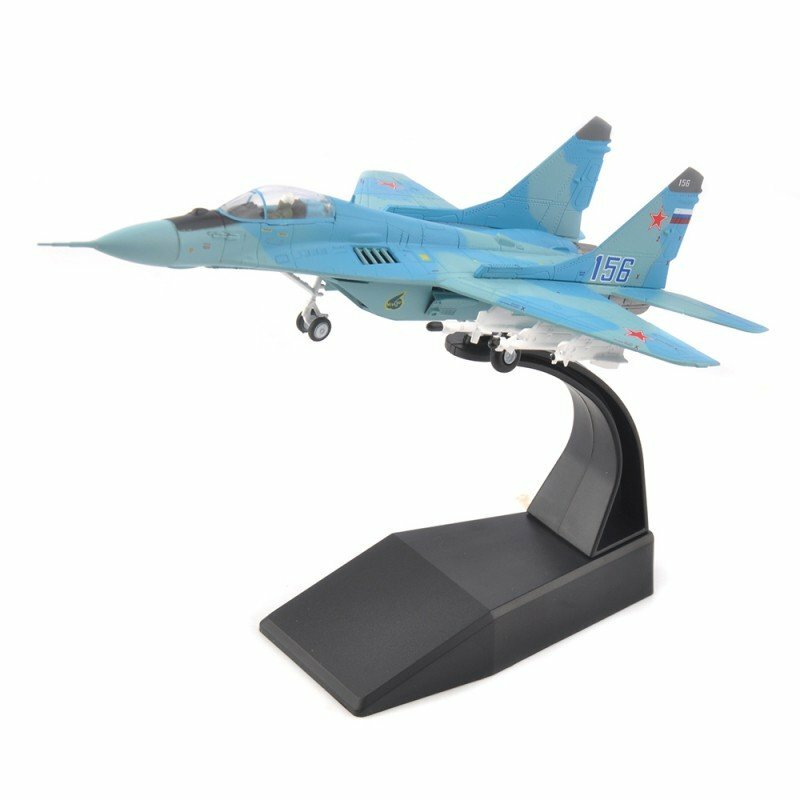 The F-15 pilots classified the target as a MiG-29. As he secured the EID, Hwang called on ‘Boomer’ McMurray to maintain the lock while he went back to search mode and began to sanitise the area around the contact for any trailers. The target check-turned to the northwest and descended to the ‘high teens’, so ‘Dirk’ flight checked 30 degrees left to northeast to maintain the cut-off. Having been momentarily placed behind McMurray in the left-turn, Hwang repositioned himself in line abreast, and then called for the jettisoning of the flight’s wing tanks. Now well above the Mach, Hwang positioned his radar elevation coverage to look from 5000 ft up to 21,000 ft in an effort to make one last sweep for trailers or other unseen contacts. AWACS simultaneously started calling out two contacts in a lead-trail formation — sure enough, he could see on his scope that his radar was just beginning to break out a second fighter in very close formation with the first. With the distance closed to some 20 miles, and the contacts at 18,000 ft, McMurray called, ‘Fox 3’ as he unleashed an AIM-120 AMRAAM. Hwang locked up the leader at about 17 nautical miles, immediately thumbed forward to his High Data TWS (HDTWS) mode and then shot his own AIM-120 inside of 16 miles. He then stepped his acquisition cursors to the trailing ‘Fulcrum’ and held the pickle button down to command a second AIM-120 on its way. Hwang was about to score the F-15’s first ever multi-bogey, double MiG kill. Assuming that McMurray had locked the leader, Hwang kept the trailer as his primary designated target. He stayed in HDTWS as the slant range closed to less than ten miles. Both targets started a check-turn to the southwest, and continued to descend into the ‘low teens’. ‘Dirk flight’ checked their RWRs to make sure that they were not being targeted, and then pointed their noses at the MiGs, assuming a pure pursuit curve. They rolled inverted from 30,000 ft and pointed their noses low and directly at the TD box in their HUDs. Pulling the throttles to idle, Hwang saw a tiny dot in the TD box about seven to eight miles out against a broken cloud background. He called, ‘Dirk 1, Tally-Ho, Nose, seven miles, low!’ Realising it was the trailer, he waited for McMurray to call that he had the leader in sight. Approaching five miles, and with no call from McMurray, he scanned without success in front of the trailer for the leader. The trailer continued its left turn to the southwest, and Hwang thumbed aft to AIM-9 and tried twice to uncage a missile, only to discover that there was no missile tone. At that instant, between his HUD and canopy bow, he saw the leader explode spectacularly at his `one o’clock’ position. Turning his attention back to the trailer, it too exploded into a streaking ball of flame seconds later. Hwang called for McMurray to assume a 080-degree heading and run his short-range radar. He thumbed aft to Auto Guns and plugged in full afterburner to accelerate to 460 knots and climb back to 20,000 ft. ‘Dirk 2′ then called, `Blind!’, but ‘Dirk 1’ quickly located him visually three miles north (left) and stacked high. Waiting a few moments to check one last time for more hostile fighters to the east, Hwang and McMurray turned to the west and departed the area. Hwang had flown a well-executed intercept according to basic USAF doctrine — manoeuvre for displacement, check EID, shoot, F-pole, and displace again, or go pure pursuit if target falls within ten miles, enter BFM if required. His decision to follow his AIM-120s to the target instead of F-poling was influenced by two factors. 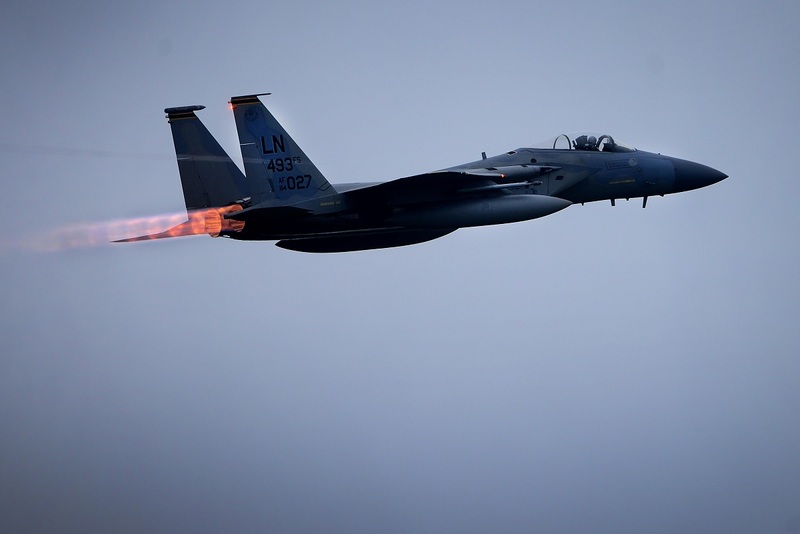 Firstly, he was winning the fight — at least he was not being fired upon — and secondly, he had closed to within ten miles of his foe, which was the F-15’s unwritten range after which it should no longer turn and run. It was later determined that McMurray’s AIM-120 had failed to hit its target. Hwang’s near simultaneous multi-bogey AIM-120 engagement had brought down both ‘Fulcrums’. F-15C Eagle Units in Combat is published by Osprey Publishing and is available to order here.